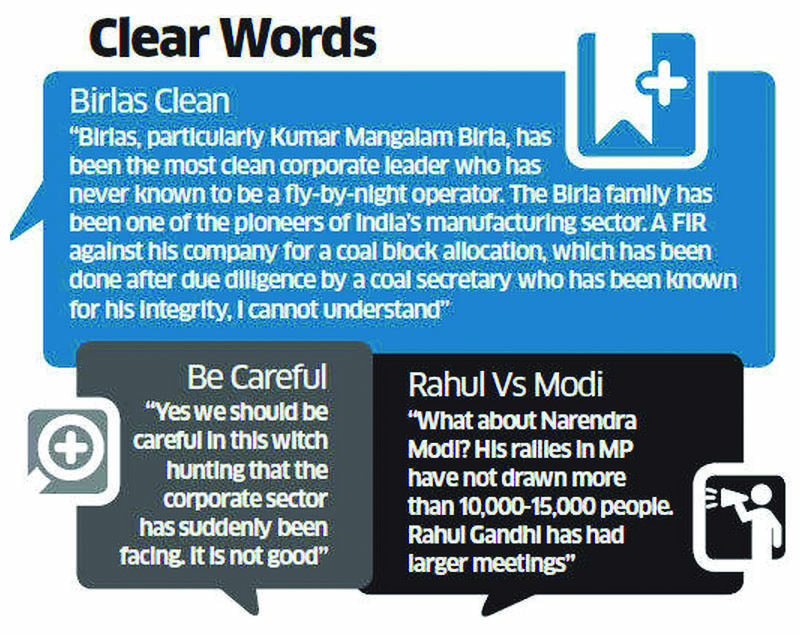 NEW DELHI: Senior Congress leader Digvijaya Singh has launched a strong defence of Kumar Mangalam Birla in the coal allocation case and cautioned his party and the government to avoid an impression of a witch hunt against the corporate sector. The generally outspoken general secretary told ET on Thursday that the FIR against Kumar Mangalam Birla could have been avoided, becoming the first big Congress leader to speak on the issue. Some Congress ministers had spoken in support of Birla when news of the CBI's FIR against him broke last month, but the party had steered clear of the issue, terming it as a matter between the investigating agency and the court. Singh appeared to suggest that the FIR naming Birla was filed without much due diligence. "If anyone has violated the law, he must be punished. But it should be done after careful examination and due diligence before filing of FIR. It is not so in this case," he said in an exclusive interview. "Birlas, particularly Kumar Mangalam Birla, has been the most clean corporate leader who has never known to be a fly-by-night operator. The Birla family has been one of the pioneers of India's manufacturing sector. A FIR against his company for a coal block allocation, which has been done after due diligence by a coal secretary who has been known for his integrity, I cannot understand." Singh, known for his proximity to Congress V-P Rahul Gandhi, said the UPA needed to be more careful as such actions such could push corporates towards BJP and its PM candidate Narendra Modi ahead of 2014 polls. "Yes we should be careful in this witch hunting that the corporate sector has suddenly been facing. It is not good." Singh said the party hadn't done anything to antagonise the corporate sector and rejected suggestions that large corporates were gravitating towards BJP in the run-up to 2014 polls. "It is not that corporates have gone against Congress party," he said, adding if anything the media and the judiciary were to be blamed for vitiating the environment for industry. "We haven't done anything to antagonize the corporate sector," Singh said, while ticking off critics in industry of the government's social sector schemes and saying such criticism was not new. "In the 1960s and 70s Indira Gandhi was hounded by big business when she started her 'Garibi Hatao' campaign. All those who belong to the 'haves' group feel any investment or allocation for the 'havenots' does not contribute to the economic growth are mistaken." Singh, a bitter critic of Modi, said the Gujarat CM and BJP had managed the perception game better than Congress. "If we do something, say something like 10, the projection is just about 4 to 5 points. But in case of BJP, if they do something worth 4 or 5 points, they scale it up to 10 points. Their capacity to create a hype is much more than Congress. What is Modi? He is just this. Where is his Gujarat model of development. All you can say is that he has got very good PR," he said, as he launched a strong defence of Gandhi whose oratory has been compared unfavourably with Modi's speeches, despite the latter's several historical bloomers. Singh, who has been campaigning extensively for his party in MP and Chhattisgarh, made light of the perceived lukewarm response to Gandhi's rallies in Delhi and Rajasthan and denied that the Congress scion had been forced to end his speeches in matter of minutes. "What about Modi? His rallies in MP have not drawn more than 10,000-15,000 people. Gandhi has had larger meetings. As it is he (Rahul) does not make very long speeches. They are about 10-15 minute-long. Oratory doesn't come easily. It takes time. Modi has been in politics for 40 years. Anyway, he is quite a gas bag. He said. "I have been in politics for more than 40 years. Don't go by people getting up in the middle of the speech. It is the standard operating procedure of BJP. They make about 15-20 people sit in the front row and when the VIP starts speaking, they get up and start leaving. I have seen this myself. Sometimes they set a cow inside the crowd. I have had a snake being thrown in my meeting. It is nothing new. It is an old strategy." Some weeks ago, Rural Development Minister Jairam Ramesh expressed frustration that Gandhi was concentrating on the long-term goal of building the party when he should be focusing on the 2014 polls. "I don't think so. Everyone has their own opinion. He has voiced his opinion. I don't agree. 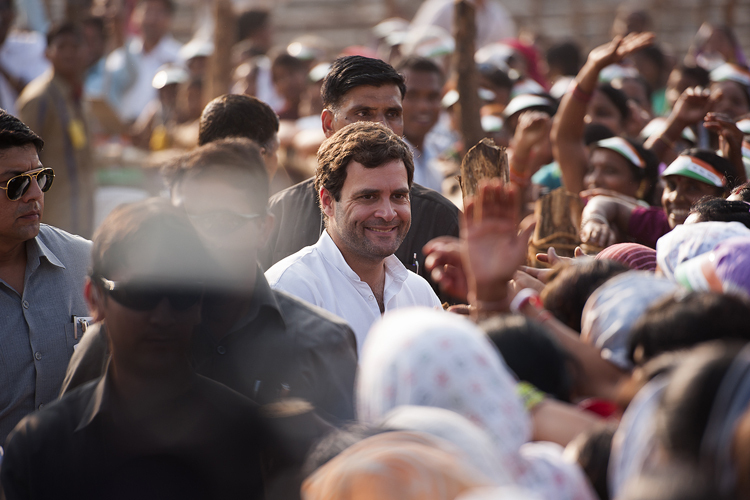 Rahul Gandhi strongly believes in systems and reducing the arbitrariness in the functioning of the party. By conducting polls in Youth Congress and NSUI, he has done just that. Now he wants to do the same in the parent Congress. He should do it in Congress because until you build your own cadre how can you fight other cadre-based parties?" Singh said.